Acadia Tucker is a New Hampshire-based farmer, gardener, and author of Growing Perennial Foods: A field guide to herbs, fruits, and vegetables (Stone Pier Press). Acadia Tucker is a modern day dirt farmer. In the process of growing hops for New England breweries and tending to extensive rows of backyard food crops in New Hampshire, she spends pretty much every day thinking about how to build healthy soil. “Every morning, I grab a handful of soil and squeeze it with my fist,” she says, “I’m looking for how it feels, crumbles and smells.” She knows if she’s treating it right, the soil holds itself in a tight ball that easily crumbles when poked, smelling richly sweet and earthy all at once. Tucker came around to her soil-first approach to growing food because she learned how much better it made her artichokes and broccoli taste. She observed how much more resilient and climate-tolerant her crops became. Plants grown in biodiverse soil also rarely need chemical fertilizers or pesticides. Fairly quickly she learned the practice she'd picked up on her own has a name: Regenerative agriculture, a practice that restores soil health, creates new topsoil, and balances water and carbon cycles. Many scientists, Tucker included, believe regenerative agricultural practices, if adopted widely enough, can help reverse climate change by drawing down carbon dioxide levels. "I never had that aha moment when it all seemed to make sense," says Tucker. "I just knew I wanted to be part of the solution." Tucker is so driven by her belief in the potential for carbon farming to create a cooler, kinder world she decided to write a book about it. Two books, in fact, both of which translate the principles of regenerative agriculture into methods backyard gardeners can use. “I really think regenerative agriculture and gardening can help us restore water, capture carbon, and promote more biodiversity,” says Tucker. Growing Perennial Foods: A field guide to raising resilient herbs, fruits, and vegetables is distributed by Chelsea Green Publishing for release in February 2019. Advance orders are available now. Get your copy here! For veteran gardeners, many of whom are still not thinking in terms of resilience, Tucker offers firsthand guidance on how to strengthen and improve their yield. 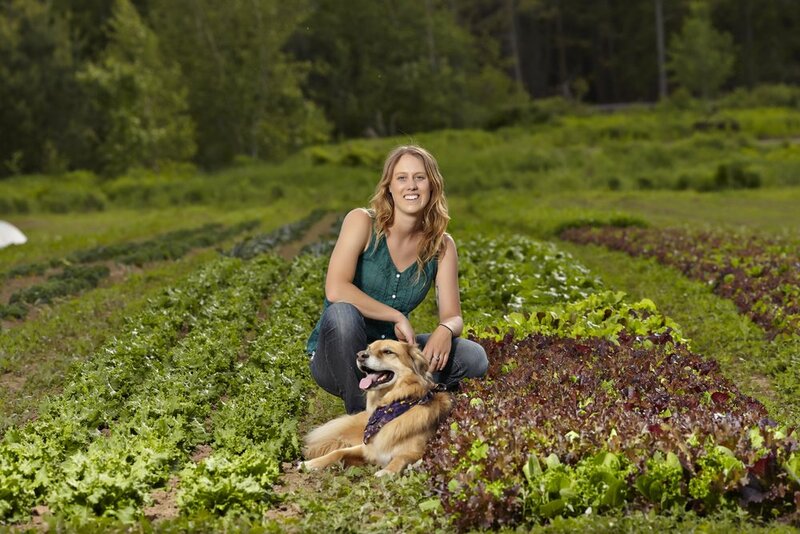 Tucker’s first experience with farming came at the end of her undergraduate career, when she was offered the chance to build a two-acre organic market garden on a former construction site in Washington state. It turned out to be really hard work, and she loved it. "When you’re a farmer," she says, "you’re also a carpenter, salesperson, chemist, community hub, mechanic, tractor operator, educator, volunteer coordinator and so much more." Within four years, she and her team were running a CSA, supplying local restaurants with fresh food, and operating an extensive volunteer and education program. Tucker developed an understanding of the science behind growing food while studying Environmental Science at Pitzer College and pursuing a Masters in Soil Science and Water Resource Conservation at the University of British Columbia in Vancouver. She still can't get enough of agricultural journals, which she devours between plantings. She also stockpiles gardening books during the busy growing season so she can read them all winter. It's this nerdish devotion to gardening books that helped her recognize the need for more support for the beginner gardener. Tucker hopes her anyone-can-do-this approach will also inspire more people to pick up a trowel because it's fun. "I was hooked on growing food the moment I tasted the first sunkissed blueberry that came from my garden," Tucker says, "And I think others will be too if given the tools to succeed at it." But she also wants to make regenerative gardening a political act, which is the theme of her second book, Growing Good Food: A citizen's guide to backyard carbon farming (Stone Pier Press, Summer 2019). "I know one person can’t save the world," she says, "but a movement can. I'm writing these books because I want to be part of that movement." Growing Perennial Foods: A field guide to herbs, fruits, and vegetables is already available for preorder. Growing Good Food: A citizen’s guide to backyard carbon farming will become available shortly. Both are published by Stone Pier Press and distributed by Chelsea Green Publishing.